Wondering if Delhi Chief Minister Arvind Kejriwal and his cabinet colleagues were authorised to hold a sit-in at the Lieutenant Governor’s office, the Delhi High Court on Monday said, "You can't go inside someone's office or house and hold a strike there”. A bench headed by Justice AK Chawla so remarked while hearing two petitions—one praying that the sit-in by Kejriwal and his ministers be declared illegal and the other seeking directions to the IAS officers in Delhi government to call-off their strike and attend meetings called by the ministers. When the bench was informed by the counsel for the ministers on strike that the IAS officers had themselves acknowledged that they have not been attending meetings called by the Delhi government ministers, the bench sought to know if the sit-in was authorised. "Is it authorised? This can't be called a strike. You can't go inside someone's office or house and hold a strike there," said the bench as it noted that the ministers have been protesting inside the LG office and not outside. While making the IAS Association a party to the matter, the bench posted the matter for further hearing on Friday. Meanwhile, BJP MLA Vijender Gupta also approached the high court on Monday against Kejriwal's sit-in. 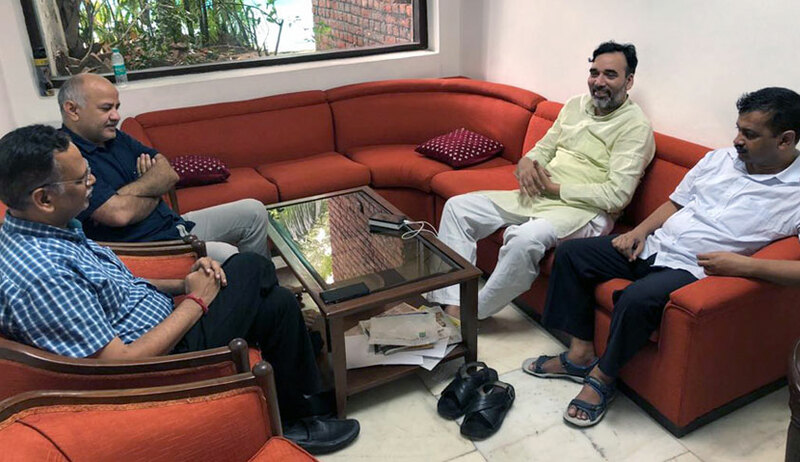 Kejriwal, Deputy CM Manish Sisodia, Health Minister Satyendra Jain and AAP leader Gopal Rai have been on a sit-in at the LG office since June 11 demanding LG's intervention in calling off the IAS officer's strike. Meanwhile, the IAS officers said they were not attending some meetings as they apprehended threat to their safety following the attack on Chief Secretary Anshu Prakash, the senior-most bureaucrat. It is to be noted that advocate Hari Nath Ram, through his counsel Shashak Deo Sudhi and Dr Shashi Bhushan, had moved high court last week praying the court to “issue a direction for discharging the chief ministerial obligations and responsibilities as the entire functioning of the Chief Minister office of NCT of Delhi state has been brought to stand still ever since the strike was called on”. He also prayed for “directing the respondents to declare the hunger strike called by the Chief Minister and his cabinet colleagues as un-constitutional and illegal”. Another petition followed closely demanding that the IAS officers be told to attend meetings so that urgent public work is not affected.